This is Part 5. You may want to read (part1), (part2), (part3) & (part4) first. Today I continue my rainy day power supply repair project. I have checked everything twice and even took a shot in the dark by replacing all the ICs on the board. I still don’t know why this circuit is not working. The power transistors on this board should supply a ground path for the motor when activated by a plus on their gates. The pulse is not appearing at the gates so I know at the heart of the problem the pulse width modulation chip (PWM) is not doing its job. I have replaced the PWM chip but that didn’t help. In this video I dig a bit deeper using my oscilloscope to look at some select voltage signals going and coming from the PWM chip. I even bypass the PWM and inject a pulse train from my function generator to test the power conditioning and power transistors. I can’t simply replace the existing PWM chip with another manual controlled PWM chip because it currently uses current sense feedback as well as signals from adjacent control circuitry to not only start the plus train but also control its duty cycle. These are critical features for a treadmill or metal lathe motor control circuit in order to maintain a selected motor speed under load. Just posted part 6 of 6 which is the final post. This is a continuing post in a series about using the Adafruit.com bicycle spoke persistence of view board (SpokePOV). 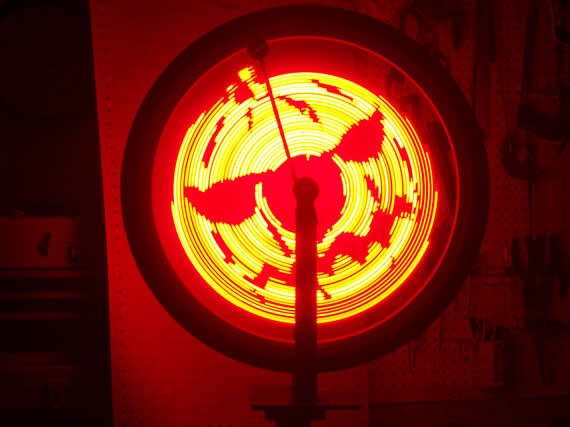 This is a great electronics kit that lets you draw amazing images like below from LEDs attached to your bicycle spokes. You can even do animations while you ride if you use 3 SpokePOV boards which is also sold as a kit. You may want to first read (part 1 of 7) of this blog post series. I was going to post the next 5 parts separately but decided to just combine parts 2 through 6 in this posting. Below is the list and you can scroll to see each section. There maybe a final separate 7th posting on creating a “Corrective Raiser image Board” (CRiB) board to correct a slight design flaw with Adafruit’s SpokePOV boards as noted in part 6 below. The SpokePOV kit comes with a very strong magnet which is used to trigger the Hall Effect sensor on the board as the board rotates with the wheel. In the suggested configuration from Adafruit the magnet just sticks to the inside of the bike’s front fork. This is not optimal because the magnet will not be adjustable with respect to the board and the magnet could easily fall off or move when encountering a bump. You could epoxy the magnet to the frame at a selected height but then the tire could be difficult to remove. You are currently browsing the ToddFun.com blog archives for August, 2011.